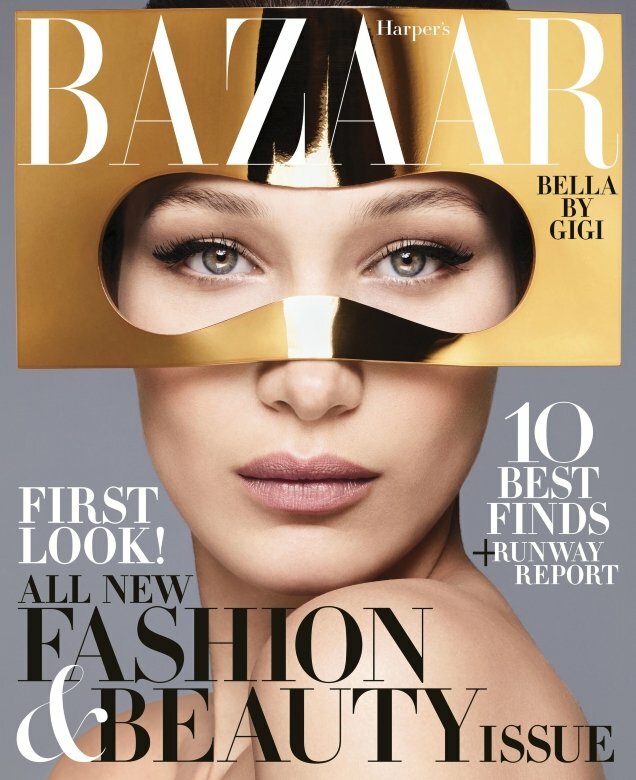 Considering sister Gigi Hadid has just made her third appearance on the magazine last month, it’s hard to imagine that Bella Hadid has never fronted American Harper’s Bazaar. We guess it’s better late than never as the beauty graces the just-released double June/July 2018 edition. Photographed by Solve Sundsbo and styled by Anna Trevelyn, Bella sports a gold Christian Dior mask and channels her inner Jean Shrimpton for the newsstand cover shot (below), giving us flashbacks to the magazine’s iconic Richard Avedon cover from 1965. In stark contrast, Bella looks serene and melancholy in the black and white subscribers cover wearing head-to-toe Christian Dior (Bella is the face of Dior cosmetics). Per usual, anything Hadid related generated mixed feedback amongst our forum members. “OK enough covers but sigh… overexposed, much?” asked kokobombon the second the covers came to light. “DAMN Bella and Gigi will never leave! Gosh, these girls bring NOTHING to the industry. They don´t express anything with their eyes, they don´t know how to pose or walk the runway. They are just there and famous for nothing,” complained Bertrando3. “OMG, I don’t even hate the Instagirls with such passion, but Glenda is really pushing me to at this stage! It’s been Kendall [Jenner] and Gigi (more frequently than celebs), and now Bella makes her entry. For what it is, I really loathe this cover,” Benn98 chimed in. TaylorBinque wasn’t into it either. “I can’t. Even when you are directed to look bored, at least you gotta convince something,” she voiced. “Like … I understand the complaints and the exhaustion of the Insta-model generation. But, frankly, I think Bella has one of the most stunningly beautiful and cover-model worthy faces of any model I’ve seen. She is magnificently, strikingly gorgeous,” defended happycanadian. Check out Bella’s accompanying cover story in all its glory and voice your own opinion with us here.